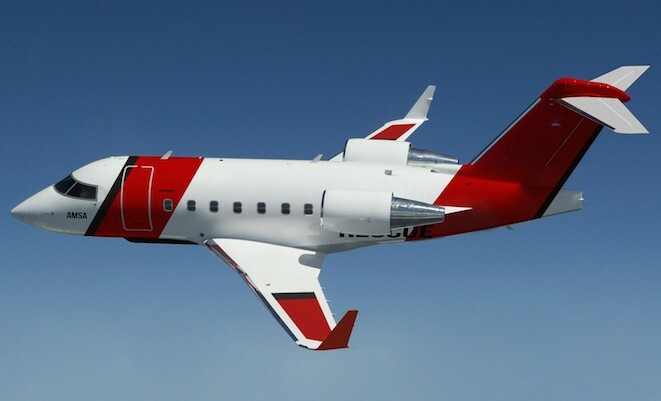 Cobham will operate four Challenger 604s for the AMSA SAR contract. Cobham SAR Services has won a 12-year, $640 million contract to supply and operate search and rescue aircraft for the Australian Maritime Safety Authority (AMSA). The new deal will see Cobham operate four Bombardier Challenger 604 special missions jets modified for search and rescue to be based at three locations around Australia – Perth, Melbourne and Cairns – from 2016. One aircraft will be based at each location, with a fourth serving as an operational spare. “The future capability will use faster and longer-range aircraft to provide a similar level of capability to our current service, but using fewer aircraft,” AMSA chief executive officer Mick Kinley said in a statement on Friday. AMSA’s current fixed-wing aircraft SAR capability is provided by Paspaley Pearl Group subsidiary AeroRescue, which operates five Dornier 328 turboprops based in Brisbane and Darwin as well as Perth, Melbourne and Cairns. AeroRescue will continue to provide SAR services until Cobham takes over the service, with operations due to begin from Perth in August 2016 and from Melbourne and Cairns from “late” 2016. Cobham will acquire, own, modify, operate and maintain the four Challenger jets, with modification work, much of which will be undertaken at Cobham’s Adelaide base, to begin later this year. The new aircraft will be fitted with a range of sensors including a search radar, FLIR, beacon and direction finders, plus satellite communications and a mission management system. In addition they will feature “high-vision” windows and air operable doors for aerial delivery “for equipment such as life-rafts, satellite phones, food and water to be dropped to a person in distress”, AMSA said. Similarly-configured CL-604 Multi-Mission Aircraft are in service with the Royal Danish Air Force, used for maritime surveillance and SAR. These aircraft were modified by Canada’s Field Aviation, which has partnered with Cobham in the past on Cobham’s Coastwatch Dash 8 aircraft. However, “At this time we are not in a position to communicate which partners have been ultimately selected to be on the program,” Peter Nottage, sector president of Cobham Aviation Services, told Australian Aviation in an emailed statement. The aircraft will be operated by a crew of five – captain, first officer, visual search officer, electronic search observer and aircraft mission coordinator. Aircraft and crews will be on permanent standby to deploy on search and rescue taskings 24 hours a day. “Building on Cobham’s 30 years of experience in special mission operations around the world, including in Australia, the turnkey solution we will provide to AMSA represents an evolutionary improvement in range capability and speed to incident sites with longer loiter and search time over the search zone,” Nottage said. The 12-year contract also includes three one-year contract extension options, which if exercised would take the full value of the deal to over $700 million. Are they operating three or four jets? The photo caption says three yet the article states four. Operating four aircraft I guess will give them one aircraft in Perth, Melbourne and Cairns with one spare to ensure there’s coverage if one is in maintenance or AOG, makes sense. Apologies – the caption was wrong (now fixed). It’s four aircraft across three bases. We’ve sought some extra info on the aircraft, but presumably one will be an operational spare. Pardon my ignorance about ‘the private sector can do it more efficiently (aka cheaper) but surely this type of capability would be better served within the RAAF and/or the RAN? The platforms could form part of the training program for maritime/recon and could be ‘housed’ within the ‘infrastructure’ of the Maritime patrol units? The US Coast Guard has selected the same aircraft for a similar role so it would make sense for Cobham to piggyback to an extent off that program. They’re a reliable, albeit a bit dated, aircraft. I expect that support would be provided by the Dash 8s on Border Protection patrol duties. They have been modified to do air drops of equipment so it would be easy enough to re-deploy those aircraft already on routine patrols to carry out SAR work. Cobham have plenty of adequately equipped aircraft and trained crews on the job to meet the requirements of both tasks – border protection and SAR. That is something that Paspaley could not, or ever match. And Paspaley give away another contract. I am sure that AMSA have their reasons for making their operational and technical choice and I am not sure anyone can say that “Paspaley gave away another contract” since we don’t know what offer they put on the table. But it is a shame that yet another large Commonwealth Government contract has gone to a subsidiary of a large overseas company. Sure Cobham will employ local people etc but ultimately the profit $$ coming from our taxes will go overseas to foreign shareholders. Maybe Paspaley was just too far away from the mark to justify their selection and the award rightfully has gone to Cobham. But it just seems like another nail in the coffin of the Australian owned and operated regional aviation community. They indeed have their problems but support with appropriate oversight and input from our nation would help in some cases and will hopefully allow them to prosper. From my observations of US Govt contracts, I am sure a similar contest over there would have gone to a totally US company before a foreign entity even if it meant a small premium had to be paid. It is interesting that a jet was selected for the capability over a turboprop. The endurance and operating costs operating the majority of the time at low level for SAR, not med/high level for surveillance, will indeed be considerable. Did someone in Paspaley not understand or accept the requirements if a jet capability was the natural outcome? Damian, with all due respect, the RAAF/RAN have enough on their plate without taking on Civil SAR duties. According to my memory of the National SAR Manual, the military will only undertake such duties if the civil authority (AMSA) is unable to provide this SAR service. Having just transited to and from Australia several times in the wake of MH-370 and the AMSA SAR requirements I visited Paspaley’s SAR operations in Darwin and other contenders for this contract, to me this announcement is surprising. I am a globally recognized special mission systems (SMS) maritime, border patrol & SAR aircraft design expert. I have been undertaking comparable systemic SAR analysis studies comparable to the AMSA SAR requirement for 25 years for C-130’s, P-3’s, S-3B’s and several other SMS aircraft. I assert that there are numerous alternate offerings to this equation which are more suited to the mission and could have exceeded the CL-604 in aircraft quantity, additional basing locations, response time, endurance, range, marine extraction technologies, human factors engineering, low altitude search criteria and a host of other performance parameters. For a known fact, this contract could have also been effectively created in “Australia” using indigenous aerospace vendors and engineering firms to undertake and domestically “drive” a significantly greater work share than is offered by Cobham. It is only my opinion but, the AMSA appears to have substantially “missed the mark” in selecting so few aircraft (a business jet) to patrol the world’s largest non-polar maritime environment. This while spending approximately $200 million AUD more than necessary to provide a lesser capability with far fewer aircraft than are required to undertake such an onerous mission over such a vast maritime territory. That such a contract would be awarded when Canberra is desperate to find ways of reducing serious fiscal shortfalls is a financial, political, and operational enigma to say the least. The RAN, RAAF or alternate private contractors could have done much better than the current offering of the day. Having flown, worked, defined requirements, developed CONOPS, and designed technologies and systems for this specific (SAR) and other maritime missions (Antarctic & Arctic), it is inconceivable that such a critical national emergency response system could be handled by a paltry three aircraft (+ 1 spare), to cover an entire continent. To change the paradigm you have to ask the right questions. The answer vests with the question(s) asked….apparently someone didn’t. I apologize for being so my subtle. I’ll try to be more specific in my observations next time. Colin Campbell I think you may be missing my point – surely some of this work (if in ADF hands) could be written off/replace training that the ADF does already? Just seems we (taxpayers) are paying for a duplication of infrastructure to support such a capability. The US (through the Coast Guard) and Canada seem to do it through their respective defence forces.